Currently being built in Chile, since July 2014, the american LSST Telescope could likely revolutionize the astronomical observation and lead to an unprecedented level of sky survey by scanning the entire austral sky within three nights only. The LSST should provide its first images in 2019 and start its scientific missions in 2022. Their goals will be to study the dark matter, quasars, supernovae, variable stars, gravitational lens, and on a larger scale to observe the internal sturcture of the Milky Way and Universe. In this article, firstly, we are describing and analyzing the outstanding technical specifications of the LSST project led by the AURA. 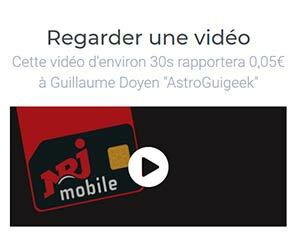 In a second part, we are explaining to you how this innovation could drastically give a support and a dynamism to the astrophysics. 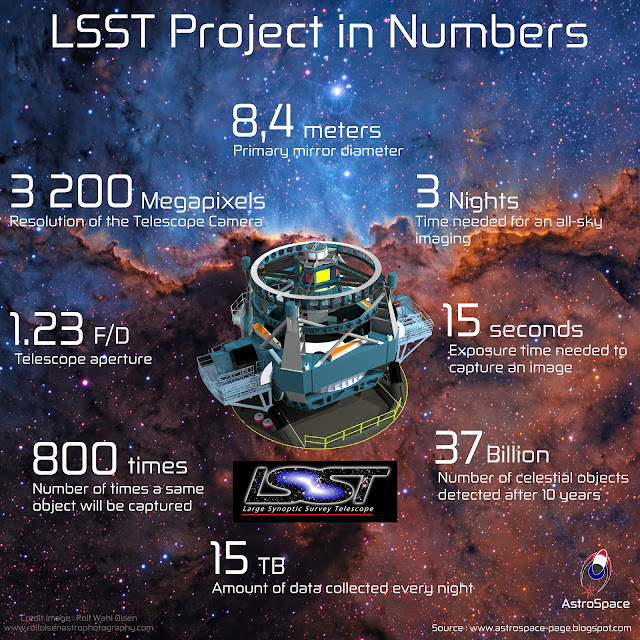 The code name LSST means "Large Synoptic Survey Telescope". The primary asset of this 8.4-meter-diameter telescope settled in Chile (Cerro Pachon) is its wide vision as the word synoptic suggests it. 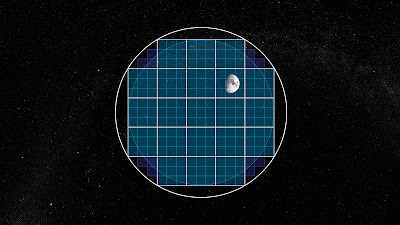 Indeed, the field of view scanned by a single image will be the tantamount of 40 full moons, and will need just a 15-second exposure time. The vision performances of the LSST is simultaneously wide and deep, since its camera is made of the worlds's greatest resolution of 3 200 Millions of pixels, namely 3.2 Gigapixels. With such features, the LSST could cover the whole Chilean's sky within 4 or 3 nights of observation, and could alert the astronomical community of a suspicious changing object in the next 60 seconds. The service duration provided by this telescope is estimated to 10 years. During this period, scientist expect that 37 Billions of stars, Galaxies, neutron stars will be classified and discovered. The global cost of the project reaches 850 Millions of dollars, whose main fundraising source comes from the 35 institutional members as well as several noticeable private institutions (Bill Gats, W.M Keck...). The optical design selected for the LSST is not similar to the ones we find on semi-professional telescopes (Newtonian, Schmidt-Cassegrain, Richtey-Chrétien...). Engineers decided to use the optical structure of "Paul Baker", namely composed of 3 reflective elements whose 2 of them are located on the same glass (see image below). This particular optical structure highlighted by the primary mirror of 8.4 meters diameter, makes the LSST very compact and enables a F/D ratio to 1.23 ! This ratio represents the quantity of collected light by expressing the focal length F over the diameter of the mirror D. The lower this number is, the higher the quantity of light collected is. Having such a low F/D ratio is not only a beneficial fact. On the other hand, it means also that the mirror aberrations are increased. It is bound to bring a corrective element in order to reach the best performances as possible. The LSST is indeed equipped with an optical correction located before the camera system. Made of 3 lenses, this system corrects the mirror aberrations to obtain an image almost perfectly plane. Of course, these corrected aberrations are not completely deleted but they have been reduced to the point that atmospheric aberrations are far more predominant than optical ones. 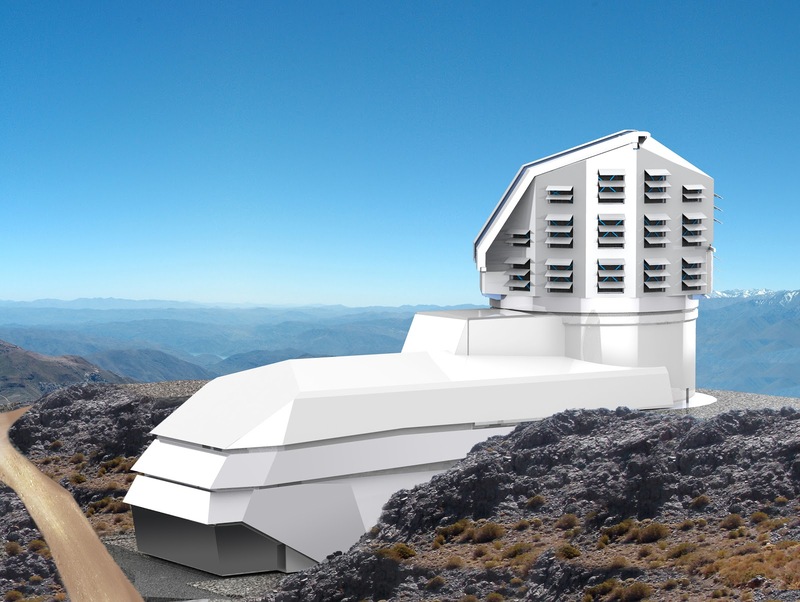 The Large Synoptic Survey Telescope will not use an Adaptative Optics system (AO) to offset the atmospheric aberrations, because it is actually impossible today to embed an AO on wide-view telescopes like the LSST. 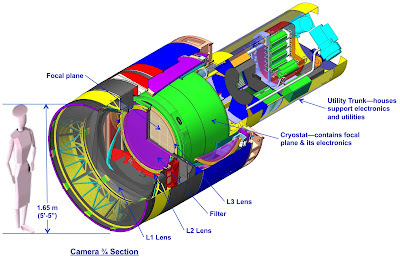 However, an Active Optics has been installed inside the primary mirror, so that the optical defects caused by weight constraints or temperature variations can be corrected. Auxiliary telescope under construction (foreground). So, what about the atmospheric aberrations ? As Active Optics does not affect anything to reduce the effect of the atmosphere, scientists and engineers had to figure out an other way of compensating them. Therefore, they decided to build an auxiliary telescope of 1.2 meters, located just next to the LSST. The principle remains very simple : this smaller telescope will monitor and measure the side effects of the atmosphere on the the part of the sky the LSST is observing. These measurements will serve as calibration frames to remove the aberrations on science images. Before reaching the camera's sensor, the incident light will pass through 6 large bandwidth filters which are sensitive from the near-infrared spectrum to the near-ultraviolet spectrum. Changing these 78 cm diameter filters requires a complex system, carousel-like. It is one of many other parts of the LSST developed in collaboration with the french laboratory IN2P3. LSST : a collaboration between the United-States, Chile and France ! In addition to the filter system, the french researchers of the IN2P3 lab' are taking part in the development of the CCD sensors, the electronic command of the camera and its software. The optical design and the camera must be coordinated to reach the impressive performances of the LSST as expected. Image showing the size the moon would have if projected onto the LSST camera. The image acquisition electronics will be divided in 31 blocks of 3x3 CCD sensors, enabling to read a captured image within 2 seconds. Each image requires a single 15 seconds exposure. The image acquisition cycle will start every 40 seconds. The readout noise of the camera is supposed to be extremely low (<10 electrons) and the camera itself will be cooled at -100°C thanks to a liquid-nitrogen-cooling system, having a mass flow of 217 kg/day. 90 % of the whole focal plane surface will be used by the camera, similar to a disk of 63.4 cm diameter. So, the area that the sensor is taking is 0,28 m². In terms of dimensions and compacity, the entire imaging system can be compared to the size of a mini-van, weighing more than 3 tons ! On the next picture (below), a 3D-illustration of the camera has been established to human-scale, so that we can imagine the size of such component. Beyond all of these technical words and principles is hiding a real assistant or astronomical hunter for the scientists, not only with impressive quality but also in a huge quantity of useful data. State of the art performances ! With its F/1.23 optical structure and its highly resolved and sensitive camera, the LSST will be capable of detecting objects of 27.7 maximum magnitude. For example, observing a pulsar located at more than 1 Gigaparsec (= +3 Billions light years) will not be a stopping point for the LSST. An interesting fact given by the scientists of the LSST, is that the current number of stars discovered by the SDSS telescope will be equal to the number of variable stars the LSST will discover ! Obviously, the ambitions shown by the LSST project could not be accomplished without a minimum of facilities which can collect and process the huge amount of data collected. Scientists estimate the quantity of data stored after every night of observation to 15 Terabytes. They will be then sent to a database in the United States. Half of the data will be processed at the Calculation center of CNRS (CC-IN2P3) in Lyon (France). France will also have a complete copy of the data science of the LSST. In 10 years of activity, the LSST will produce an archive of data representing around 200 Petabytes, or 200 000 Terabytes ! The LSST project is considered to be one of the most exciting projects for the international astronomical community. Of course, we must not forget the first lights of the E-ELT in Chile too, scheduled in 2024. Follow AstroSpace blog and on social medias to stay tuned ! These article contain a lot of infortion. Great article and a nice guide.